For Khartoum, these shortages—in part engineered by the regime—are welcome news from the three marginalized areas in which they are engaged in genocidal counter-insurgency efforts. The news comes even as reports indicate that UN actions have forced some more than 27,500 Nuba to return to South Kordofan from South Sudan, including some 15,000 from Yida refugee camp in Unity State, South Sudan (see below). • 11 clinics have closed and 49 are at risk of closure in Darfur, South Kordofan and Blue Nile due to funding shortages. • About 769,000 people (IDPs and host communities) are affected by these funding shortages. US$7 million needed to keep these facilities running for one year. 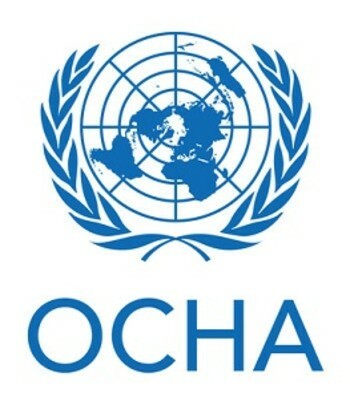 The UN Office for the Coordination of Humanitarian Affairs (OCHA) in Sudan reports in its latest weekly bulletin that a lack of funding is forcing humanitarian organisations to either hand over or close down their health facilities in some parts of Sudan. In Um Keddada in North Darfur, about 140 suspected cases of diphtheria have been recorded. From January to September, 173,973 children suffering from acute malnutrition have been treated across Sudan. About 27,500 Sudanese refugees have returned from Yida camp in South Sudan to Sudan’s South Kordofan. The latest Sudan Health Sector Quarterly bulletin reports that the Sudanese Ministry of Health and the World Health Organization (WHO) assessed 60 health facilities in North, South, and West Darfur, Blue Nile and South Kordofan states. They found that 11 clinics have already closed and 49 are at risk of closure. The bulletin said that 769,000 people, including displaced and their host communities, in these states may face significant difficulties in accessing primary health care services as a result of funding shortages. About $7 million is needed to keep these facilities running for one year. According to the report, consequences of funding shortages include people not being able to access health services or buy medicine; no access to immunisation services; less assistance in the control of communicable diseases and outbreaks; and lack of referrals of complicated cases to other facilities. Aid organisations are increasingly concerned about the decline in funding for health programmes in Sudan. 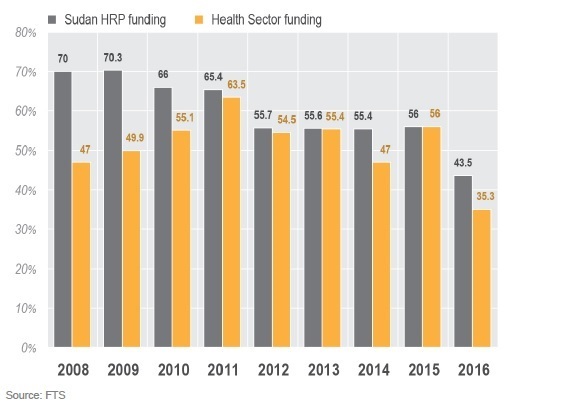 The health sector is only 35 per cent funded as of 17 November, according to the Financial Tracking Service (FTS) for Sudan, which tracks financial contributions against the 2016 Sudan Humanitarian Response Plan (HRP). The North Darfur Ministry of Health has reported 21 suspected diphtheria cases in the Um Keddada area in the east of the state over the past week. This brings the total number of suspected diphtheria cases in Um Keddada since August to 137 including 13 deaths. Health partners are working on case detection and management to stop the spread of the disease, the OCHA bulletin reads. The UN Children’s Fund (Unicef) reported in its Sudan Humanitarian Situation Report for October 2016 that the Sudanese Health Ministry released the results of the national mass mid-upper arm circumference (MUAC) screening campaign, which was carried out between end of August and beginning of September 2016. Over four million children aged 6-59 months were screened across the country – representing 75 per cent of all children under five in Sudan– by Unicef with support from the Directorate-General for European Civil Protection and Humanitarian Aid Operations (ECHO). The Ministry of Health’s National Nutrition Programme has allocated resources for the procurement of therapeutic and supplementary food items for the treatment of acute malnutrition in states where humanitarian partners have no presence. According to Unicef, 31,177 children suffering from Severe Acute Malnutrition (SAM) were admitted for treatment in outpatient therapeutic treatment programmes in September. In Sudan, an estimated two million children under age of five suffer from acute malnutrition annually, according to the 2016 Humanitarian Needs Overview (HNO). The Nutrition Sector is only 33 per cent funded against the 2016 HRP as of 17 November, according to FTS. According to the Famine Early Warning Systems Network (FEWS NET), conflict and food insecurity in South Sudan are reportedly pushing Sudanese refugees to return to South Kordofan. FEWS NET reported in its latest report that an estimated 14,400 Sudanese refugees returned from Yida refugee camp in South Sudan to South Kordofan during August. This brings the number of recent returnees from South Sudan to South Kordofan to more than 27,500 people. The returns were reportedly mainly to Sudan People’s Liberation Movement-North (SPLM-N) controlled areas in the Nuba Mountains. The UN and partners do not have cross-line access to SPLM-N areas in South Kordofan and are therefore not able to verify these reported returns and humanitarian needs. 100% of the proceeds of all sales are donated to organizations such as Oxfam, Save the Children, and Action Against Hunger.